The world famous Charles Renee Mackintosh building has gone up in flames. Students were busy placing their final degree work in the building. 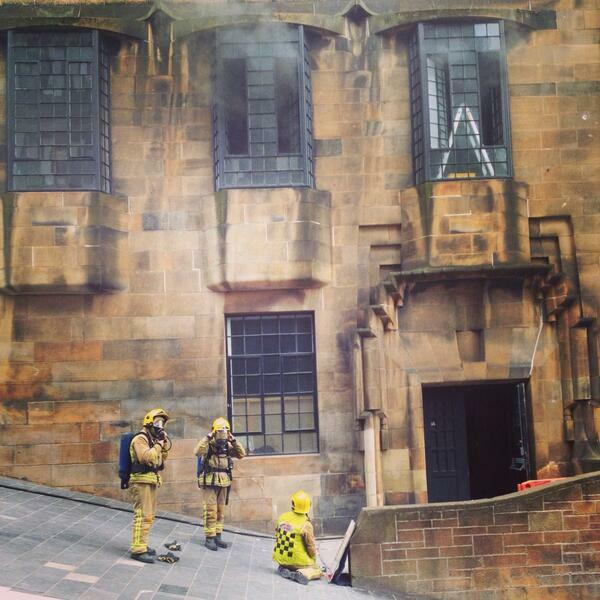 Glasgow School of Art, one of Scotland's most iconic buildings, is on fire. The fire broke out at around 12.30pm on Friday afternoon, hours before the deadline for students to submit their final work for their degree. This video shows the intensity of the fire. Flames were quickly shooting out of the windows of the building, which is Grade A listed and was completed in 1909. The fire, which the BBC reported began when a projector exploded in the basement, quickly made its way to the top of the five storey building. Smoke could be seen from all over the Scottish city. Firefighters rushed to the iconic central Glasgow in the hope of saving the building. Glasgow School of Art fire. Hope everyone is safe and fire brigade can save the building. They used ladders to try and get above the fire. Students have been left in tears as the building goes up in flames with their work inside. This is how the art nouveau building looked before the fire. Alumni of the school include Alasdair Gray, Peter Capaldi and members of Franz Ferdinand, in addition to multiple Turner Prize winning artists. Flames are now pouring out of the building's windows. And this is the original library that is at risk. But right now students are fearing the worst for their work.